One of the most prickly nettles for governments in India today is land acquisition for industry. The Centre is drafting a new Bill on the issue, but land is a state subject, and different states have different land acquisition policies. The Bill can at best provide an enabling framework. In the second of a two-part series, Business Standard takes a look at the scenario in Uttar Pradesh, Tamil Nadu, Karnataka, Gujarat, Maharashtra and Haryana. Part 1: Who tilled my land and ate my pie? In the recent times, oppositions to land acquisition in Greater Noida in Uttar Pradesh, the Mahuva region in Gujarat's Bhavnagar district (for the Nirma Group's cement plant), Bellary in Karnataka (for an airport and an ArcelorMittal steel plant), besides Srikakulam in Andhra Pradesh (for a thermal power project of NCC Ltd), have seen the state governments concerned hogging the limelight for the wrong reasons. "There have been a few instances in the past where big projects have not brought in adequate compensation for the people. These days, whenever land is acquired in the name of a mega project, people's expectations shoot up even though we have a benchmark valuation of the land to be acquired," says Orissa's minister for revenue and disaster management, S N Patra. 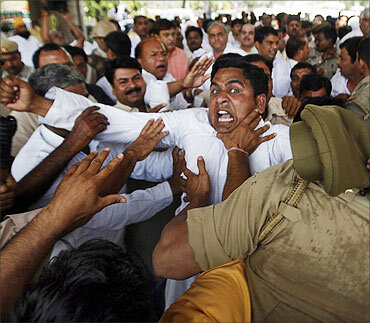 Image: Farmers scuffle with police during a protest march at Noida. The state government negotiates with landowners instead of using the Land Acquisition Act to acquire land -- a formula that has gone down well with most people in the state. 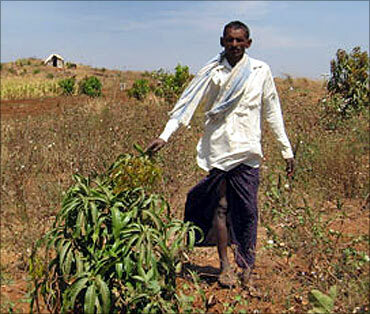 The land acquisition issue and its political implications, have forced a national debate. Business Standard takes a look at the two sides in relation with some of the states. 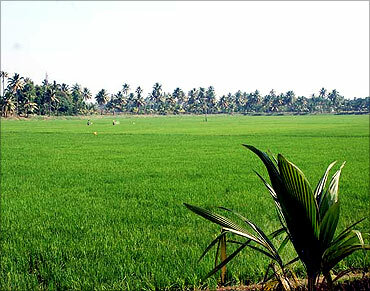 Image: Farmland in Tamil Nadu. Following recent conflagrations over land acquisition issues, the Uttar Pradesh government announced a new land acquisition policy on June 2. According to it, land will be acquired by private developers; the state will play the role of a facilitator. Companies or private developers, however, will have to seek the consent of at least 70 per cent of affected farmers -- a key recommendation of the NAC as well. The state and its agencies will continue to acquire land for infrastructure projects and town planning. 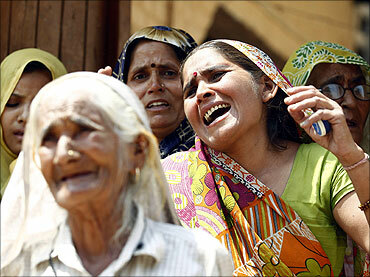 Image: Women weep after police arrested their family members, following clash between farmers and police. The new policy takes effect prospectively, and does not cover projects for which land has already been acquired. It promises added benefits to farmers and revises certain provisions of the earlier policy announced on September 3, 2010. Besides compensation, farmers will get an annuity of Rs 23,000 per year per acre for the next 33 years, going up by Rs 800 every year. 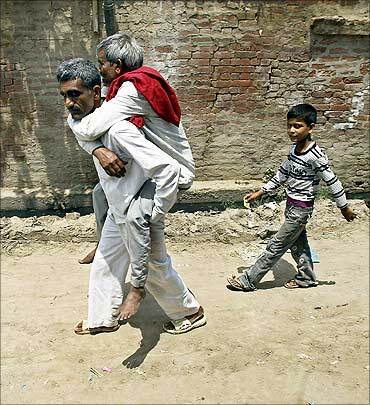 Image: A villager carries an injured man to a hospital after farmers clashed with police. In the earlier policy, this amount was Rs 20,000 per acre, going up by Rs 600 every year. 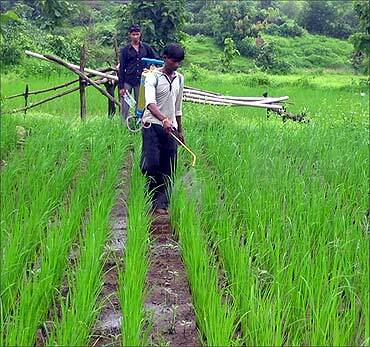 Farmers can also settle for one-time compensation of Rs 2.76 lakh (earlier Rs 2.40 lakh) per acre. The new policy has three parts. The first deals with land to be acquired for basic infrastructure, such as highways and canals, which will be based on mutual agreement. 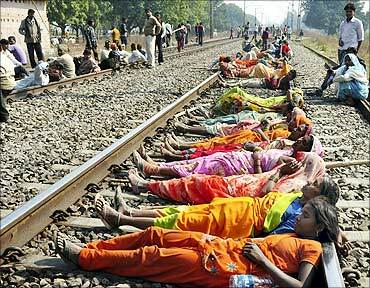 Image: Farmers block railway tracks during a protest in Karchana town in UP. The second part will deal with agencies that prepare master plans for planned development. Karar Niyamavali or mutual agreement will guide land acquisition for this and allow for all the benefits announced in the earlier policy. A key difference now is that farmers will also be entitled to get 16 per cent of the developed land for free. 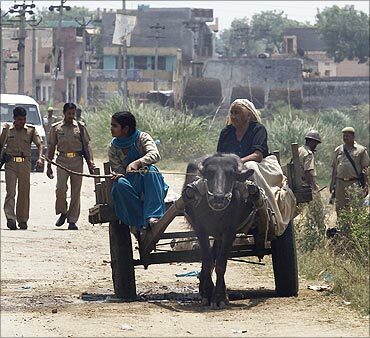 Image: Police patrol as villagers ride past in a buffalo cart in UP. If the farmer does not intend to keep the land or part of the 16 per cent developed land, he could liquidate a part of it for cash. The third part deals with land acquisition for development and other commercial purposes by private developers, where companies can negotiate and acquire land directly from farmers, provided they have the consent of 70 per cent of the affected people. 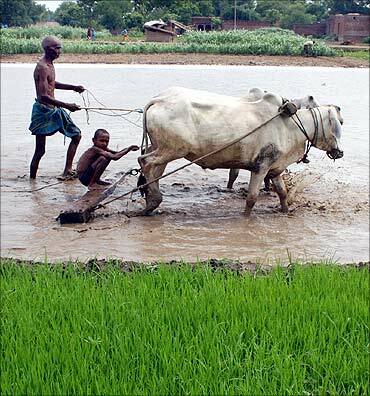 Image: A farmer and his grandson plough a rice field in Gopalsarai village. Tamil Nadu, one of the most industrialised states in the country, has not yet seen any major protests against land acquisition. The state government negotiates with landowners instead of using the Land Acquisition Act to acquire land. Around 3,000 foreign companies have set up shop in the state, including 35 Fortune 500 companies. The state has around 26,000 factories, which together employ 1.77 million people. The state also has 22 multi-product special economic zones. Until now the state has reported no major land acquisition issues. This is mainly because the interest of the landowners has been kept in mind and most of the industrialisation has happened on wasteland, according to Sunil Rallan, president of the Tamil Nadu Association of SEZ Infrastructure Developers (TASID). Image: An employee assembles a computer on the production line at a Dell factory in Sriperumbudur. Land acquisition has been largely taken care of by the State Industries Promotion Corporation of Tamil Nadu. Tata's Rs 2,300-crore (Rs 23 billion) titanium dioxide project, for which a MoU was signed in 2002 with the state government, never took off due to land acquisition problems. But this had more to do with local politics and industry pressure, said an industry source. Interestingly, 70 per cent of the SEZs in the state will be located 200-500 km away from the main towns, mostly in Tier-II and -III cities, while 25 per cent will be within an 80-km radius of the main city. This partly explains the lower incidence of protests. Image: 70 per cent of the SEZs in the state will be located 200-500 km away from the main towns. In Karnataka, there are two types of policies pertaining to land acquisition, and the Karnataka Industrial Areas Development Board (KIADB) acquires land for all industrial projects. KIADB is a wholly-owned infrastructure agency of the Government of Karnataka, set up under Karnataka Industrial Areas Development Act of 1966. Under this Act, KIADB acquires land for large industrial projects or single-unit complexes, and also develops industrial estates. There is also a general land acquisition policy, under which land is acquired for public utilities like electricity lines, drainage works or roads. The KIADB normally notifies land for industrial projects, negotiates with farmers or land owners the compensation based on the guidance value prevalent in a particular area and fixes the land value after the deputy commissioner concerned gives his recommendation. 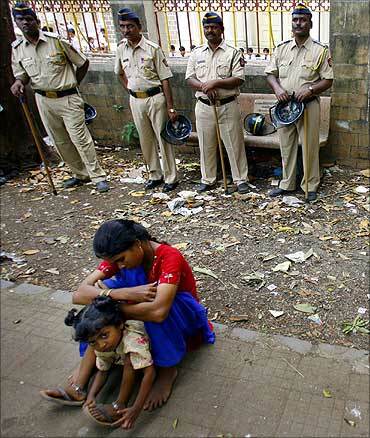 Though there have not been Singur-like instances in Karnataka in recent years, there have been a few protests. 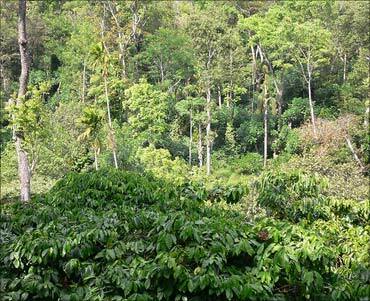 Image: Coffee plantation in Karnataka. Recently, farmers opposed the acquisition of land in Bellary for an airport and the setting up of a steel plant by ArcelorMittal. There was also opposition to the acquisition of land for Tata Metaliks' steel plant in Haveri district and an NTPC power plant in Bijapur district. The opposition was mainly on account of low land compensation. However, these issues were resolved after the government raised the cash compensation. 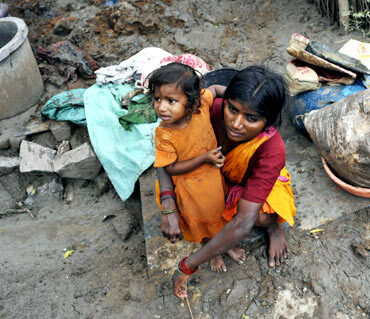 Image: People sit with their belongings in the flood-affected area of Sidragudda village in Bellary. Last December, GIDC had announced the land acquisition policy. The policy entails acquisition only with the consent of land owners, and payment of the prevailing market prices, to be decided by an independent body, the Centre for Environmental Planning and Technology University. In accordance with this policy, any landowner who loses his entire landholding in the village is entitled to a one-time financial assistance equivalent to 750 days of minimum agricultural wages for loss of livelihood, amounting to Rs 75,000. 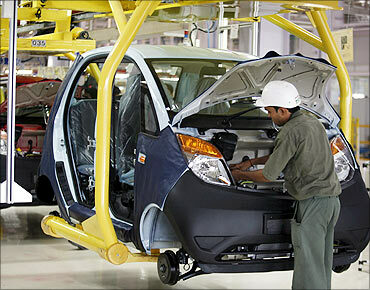 Image: An employee works inside the newly inaugurated plant for the Tata Nano car at Sanand. 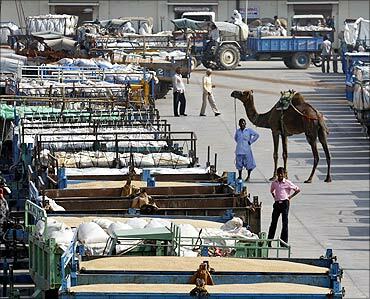 Image: A herdsman with his camel stands near parked tractor trolleys loaded with wheat. Additionally, any landowner who becomes a marginal farmer as a result of the land acquisition is entitled to a one-time financial assistance equivalent to 500 days of minimum agricultural wages. However, in recent months, a wave of protest was seen in the Mahuva region of Bhavnagar district against a cement plant proposed by the Nirma group. Experts, however, said the conflict was based on environmental rather than social grounds. Image: Nirma plant at Mahuva. Land acquisition in Maharashtra has become a complex issue despite the state government's policy that it would not be done under duress. According to government records, implementation of power, irrigation, special economic zones and several other development projects have been either delayed or suspended following opposition from local villagers over land acquisition. Currently, in Maharashtra, land acquisition is carried out through the district collector, who is the land acquisition authority for projects being developed by the central and state governments, its undertakings and also by the private sector. 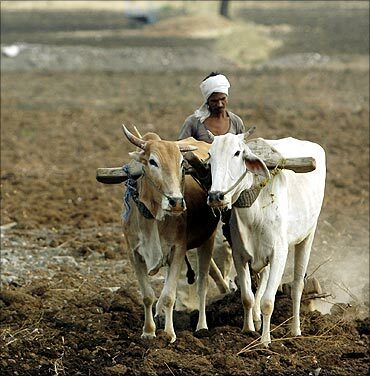 Image: Farmers plough the seeds into a farm land in Dasgaon village. Land is acquired under the Land Acquisition Act, 1894, the amended Act of 2007, the Maharashtra Industrial Development Corporation Act, 1961, the NHAI Act and the Cidco Act. The district collector is vested with the power to undertake forced acquisition after the due process award is passed. A recent example is acquisition of land for the 9,900-Mw Jaitapur nuclear power project. The land holder is paid after going through sale deeds of the last five years and ready reckoner prices, whichever are higher. 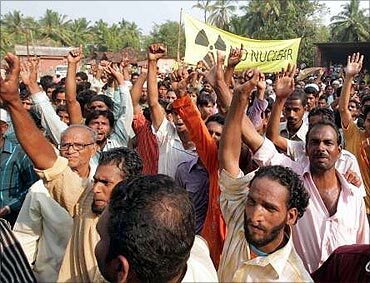 Image: Protest againts the Jaitapur nuclear power project. Also, the government recently issued a resolution, whereby the land acquisition body, with the permission of the district collector, could undertake acquisition and pay the project-affected persons in line with the ready reckoner. It is acquisition, but with the consent of farmers. Compensation is paid to project-affected persons in line with the provisions of the Maharashtra Project Affected Persons Rehabilitation Act, 1999. Image: Compensation is paid to project-affected persons. The compensation amount differs from region to region and project to project. The Maharashtra Rehabilitation Authority has been set up to supervise smooth implementation of rehabilitation packages. The Maharashtra government in February 2011 suspended its land acquisition process for the Maha Mumbai Special Economic Zone (SEZ), promoted by Mukesh Ambani and Anand Jain. 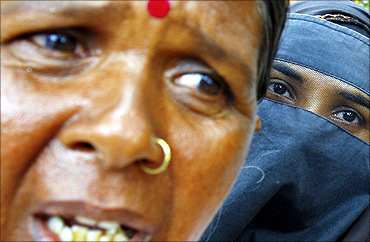 Image: Women shout slogans during a demonstration by people displaced by development projects in Mumbai. The state issued a government resolution to de-notify the land acquisition process for the SEZ, clearly indicating that it would not acquire any more land for the SEZ. 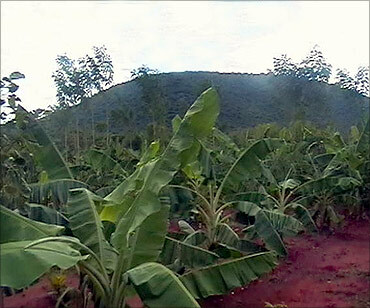 The government also indicated that about 1,000 hectares acquired in the past would be returned to the villagers. 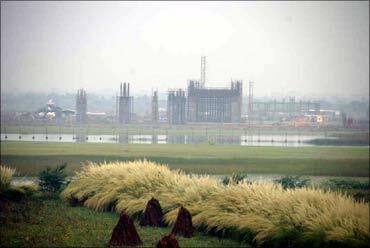 Earlier, in August 2009, the state government scrapped the SEZ proposed by Videocon in Pune after farmers said they did not want to give up their irrigated land for the project. 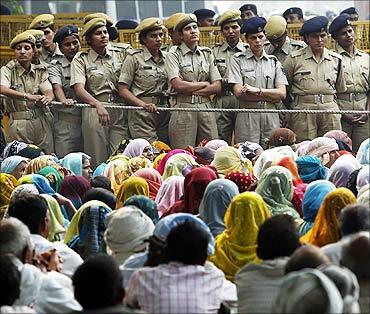 Image: Police stand guard as farmers listen to a speaker during a protest in New Delhi. Land acquisition for industry in Haryana has become a costlier as well as tougher proposition for developers. The state government claims that its land acquisition policy is the best in the country, but the farmers' lobby believes the policy has snatched away farmers' bargaining power. There are 34 notified SEZs in Haryana. Of these, 30 are in the Gurgaon region, the IT hub adjacent to Delhi. Navin M Raheja, managing director of Raheja Developers, points out that acquiring contiguous land is the biggest challenge developers are facing in Haryana. The state government seems to have realised the problems SEZ developers are facing, and the Industrial Policy 2011 indicates that it has decided to play the role of a facilitator, subject to certain conditions. According to the revised land acquisition policy announced in September 2010, the amount paid over 33 years to landowners in Haryana works out to Rs 10.89 lakh per acre. This is against the annuity amount of Rs 15,000 per acre per annum with an increase of Rs 500 every year to be paid to land owners earlier, the revised policy says landowners will be paid an annuity of Rs 21,000 per acre per annum with an increase of Rs 750 every year for a period of 33 years. 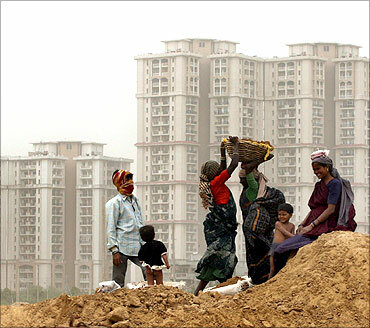 Image: Labourers work in front of high rise residential colonies in Gurgaon. It's poor farmers vs Gujarat government and Nirma!